Switzerland's Jo Vonlanthen was a car dealer before he went motor racing. After several years in Formula Vee and Formula 3 he won the modest Swiss F3 Championship in 1972. This set off an F2 drive in a GRD, getting on the podium just once at the Rome GP at Vallelunga. In 1975 at Estoril, he then topped this best result by coming in a surprise second in a March-BMW 742. With some local Swiss sponsorship he then made a short foray into F1, driving three races, of which this appearance at the 1975 Austrian GP was his last and the only qualifying for the World Championship. (This was the famous Grand Prix cut short when a thunderstorm flooded the track, handing victory to Brambilla's March.) Vonlanthen qualified 29th of the 30 cars entered but was allowed on the grid when Brian Henton and Wilson Fittipaldi hit practice problems and Mark Donohue crashed tragically in his Penske March 751, succumbing to his injuries in hospital on Tuesday. Several months earlier, Vonlanten's first F1 drive was a works Ensign opportunity at the International Trophy spring traditional at Silverstone before getting into the rent-a-drive second Williams in his home Swiss GP at Dijon. This non-champ race on the Burgundy track was later revived for a one-off in 1982, this time counting for the Championship. The 1982 edition brought sweeter memories for the Williams team, by then turned into a front-running team - it saw Keke Rosberg's single win in his World Championship year. This performance was in sheer contrast to the disastrous 1975 season, Frank fielding a pair of aging FW cars to, well, anyone interested... In 1975 Vonlanthen's No. 20 was driven by the likes of Merzario, Migault, Ian Scheckter, Magee, Ashley, Zorzi and Lombardi, while the No.21 was shared between Laffite, Brise and the elder Scheckter again. 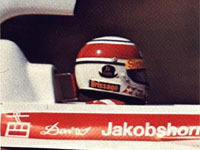 For Williams things had to get worse in 1976 and 1977 before a certain Patrick Head headed up the design department. The outfit then successfully surpassed the inventor to come up with the Lotus 79-inspired FW07. The rest is history.